Now back in print!!!! Here is a unique and wonderful book for students who have mastered the basics of reading and are ready to venture forth into the world of longer stories and chapters. Ana Spotts, whose fresh and lively illustrations bring each story to life, created this book as her Senior Project at the Denver Waldorf School. She selected each story, many of which are old, traditional tales that have been told over the centuries, for its sense of the wonder and enchantment that can be found throughout the natural world. There is joy these tales that will captivate and reassure our young children that the world is alive with magic and well with goodness. This is simply a wonderful way to ignite a love of reading and nature at one and the same time! Story teller Brien Masters regales early readers with tales of urban adventure. Characters both animal and human are a warm-hearted delight, carrying the student through carefully crafted stories that serve to build both ability and confidence in reading. Most children in late first grade or early second grade could begin reading from this book. By the end of the book, they will have become quite accomplished at an average third grade level, but don't count on them waiting until third grade to finish the book! Illustrated with beautiful watercolor and black & white drawings. Generally, Hay for My Ox is introduced as a reader at about the middle of Grade 2 and is used through Grade 3. Students will need to have a good command of decoding skills as well as recognition of basic sentence structure. 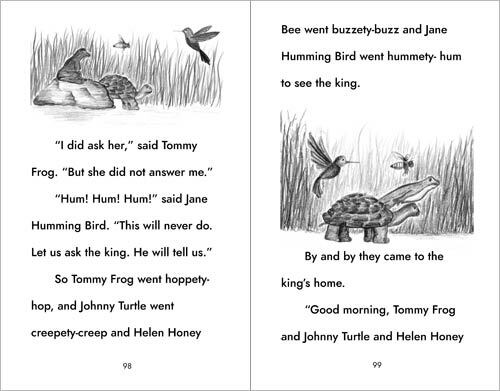 Rhythmical repetition of words, sounds, and phrases is used throughout the book but especially widely in the tales for younger children. The stories themselves are engaging and beautifully written. Welcome to Tomie's Childhood Home! I just love this series which combines Tomie dePaola's delightful world view with a warm and gentle picture of life as it was when he was a boy. It is an exciting introduction to the world of chapter books, filled with dePaola's characteristic warmth and whimsy. The fact that it is also autobiographical adds a dimension of richness to these stories that simply can't be beat for captivating young readers, making them ask for more. The text is written at a late-2nd/early-3rd grade level for most students. Book 2 in Tomie dePaola's 26 Fairmount Avenue series of early chapter books. Tomie can't believe that anything could be more exciting than moving to a new house. Then he finds out that a new baby is coming. Will it be a sister? That's what Tomie hopes. While he's waiting for her to arrive, there is plenty to keep him busy, including tap dancing lessons and tryouts for a play about Peter Rabbit. We can share Tomie dePaola's funny personal memories that charm both children and adults. Ideal for children 7-10. Shelley Davidow has again gifted young readers - this time with a chapter book written to follow her beautiful Early Readers books. In it, we meet again several of the characters from her introductory series, most notably the boy Tim and Jake the (magical) Snake. Tim and Jake become fast friends, both of them deciding that they simply must be together. This entails Tim sneaking Jake into his home (Tim's mother is not all that fond of snakes) and into school (where pet's really aren't invited). Through their adventures, they both discover some truths about the differences between life in the wilds and in a home, and how it is that we change our habits and inclinations out of love for each other. Not to mention that by the end of this reader your student will have mastered the basics of decoding, punctuation meaning and sentence structure. What better way to boost a new reader's skill than to have them read a page turner! Shelley Davidow has created the reader of children's dreams - a phonetically stepped adventure story! Readers will follow Tim who they will remember from the earlier Phonetic Readers, and his friends Mina and Jo through a mysterious secret door that leads into a magical world where fox, baboons, panthers and rats contend with each other with the kingdom as the prize and good winning the day as it must. In addition to hardly being able to wait to find out what happens next, the by now very eager readers will discover new diphthongs and learn them without even noticing they've done so. Mystery, adventure and phonetic compounds - what could be better? Meindert DeJong, a Newbery Award-winning author, published The Last Little Cat nearly four decades ago. Now it is back in print to delight us all. The last little cat was born in a kennel, surrounded by dogs and dog cages and dog noises. The little cat was always half cold and half hungry - until the day it fell into the cage of hte old, blind dog. Then, for a while, the last little cat was warm, and the last little cat was well fed. But how could such a small cat know that the barn doors are closed at night and that there are people in the world who do not want to help a helpless kitten? This story of how the last little cat found a home, not just any home but a perfect home, is one that any child will love. It can serve as an early "long book" reader (late 2nd grade, or thereabouts, depending on ability) or a warm and loving "read-to-me" (age 4 and up). A true book for the heart. I have no trouble at all imagining the thrill of delight children will experience as they discovers that now they can read some of their favorite stories themselves. Arthur Pittis retells 24 folk and fairy tales from around the world in this volume, using progressively controlled and increasingly rich sight and phonetic vocabulary development from story to story. Sentence structure also develops throughout the book, taking the young reader from simple sentences to a variety of complex structures in the course of the year. AND - and this is most important of all, at least to me - these stories simply sing with interest. There is nothing stilted or "dumbed down" about them, even the first one is alive in the telling and rich in the reading. This book and the entire series are a triumph in pedagogical reading material. Hallelujah! I can't think of anything else that speaks better to the heart of a child commencing third grade. And the entire volume moves forward from that jewel-like beginning. When I Hear My Heart Wonder picks up where As My Heart Awakes with even more fables and stories of saints. There is a joyous lilt to these stories, that lifts the heart as they are read in order. What a lovely thing for a child: by the end of the year, I believe these stories will entrust them with the feeling of not only having crossed the Jordan, but of having created a home for themselves in their hearts as well. Oh, and they will be learning to read very well, too. By third grade, if a student is still having significant struggles with the written word, extra lesson work is often recommended. Snip, Snap, Snout! is perhaps the best remedial reading book ever written. Stories are kept short, but they are never dull or contrived. 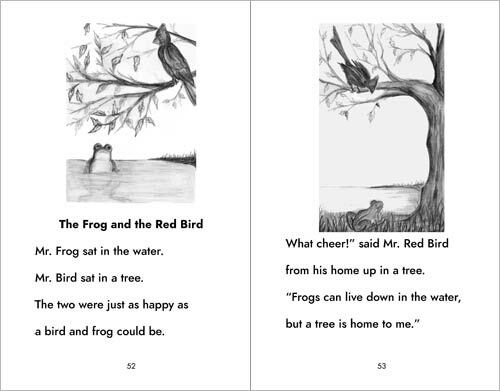 The trained eye can catch that each story focuses on different word groups, sounds, punctuation and grammar, but all this is done so very artistically that someone who didn't know this was a book of stories for remedial reading would never notice. As with the other grade 3 readers, this one recapitulates the grade 2 curriculum of fables and saints, and does so with grace, charm and warmth. The sometimes outrageous folk tales of the early days of America are the focus of this riveting reader for advanced fourth grade. You'll find Brer Rabbit, Davy Crocket, John Henry, Johnny Appleseed, Sweet Betsy from Pike, Pecos Bill and more in this book that takes the young reader through written English and on beyond into the worlds of dialect and (appropriate) slang. What a great way to harness fourth grade energy! This reader is such fun it was hard to put it down so I could write about it.